Give a little time. Get a lot back. St. Mary’s Food Bank Alliance distributes 45,000 Emergency Food Boxes, at no cost, to individuals and families in need every month. A majority of those receiving Emergency Food Boxes includes the elderly, children, working families and the homeless. Join us to pack these emergency food boxes with non-perishable items, sort food or repack bulk produce. Positions include high impact roles such as palletizing the completed boxes, as well as, less strenuous jobs that can be done seated. * We ask that all group scheduling (5+ volunteers) is completed personally by contacting a SMFBA staff member. Please email the shift opportunity leader or call 602-343-3134. - Youth 12-15 years old may volunteer with an adult present. Please contact the opportunity leader directly to sign up. No online registration required for minors. VOLUNTEER PARKING IS LIMITED. PLEASE CARPOOL AS MUCH AS POSSIBLE! The comfort and safety of our volunteers is important. Due to health codes and safety reasons, a strict dress code is in effect. 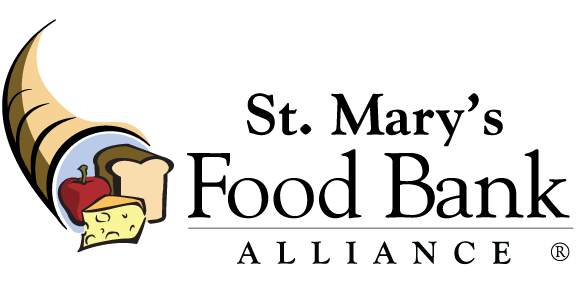 Celebrating its 51st year as the world’s FIRST Food Bank, St. Mary’s Food Bank Alliance is a non-sectarian, nonprofit organization that alleviates hunger by efficiently gathering and distributing food to 689 partner agencies at 886 locations in Arizona that serve the hungry. Serving nine of Arizona’s 15 counties, the organization is a member of Feeding America, the national network of food banks, and is committed to volunteerism, building community relationships, and improving the quality of life for Arizonans in need. In Fiscal Year 2017-18, the Food Bank distributed more than 88 million pounds of food to Arizona families and children and garnered more than 213,000 volunteer service hours. Web site: www.StMarysFoodBank.org Phone: 602-242-FOOD.